Christmas is almost here! Can you believe it? Two days until the big day! I still have a few bows to put on presents, pick the house up, pack the car and I'm ready to head to my Sister's house in Brownwood, Texas. Can't wait to be with my family! If you are looking for some gift inspiration, please join me this morning on Graphic 45's Blog to get a closeup look at some Handmade Holiday Ideas from Donna Espirtu and myself. 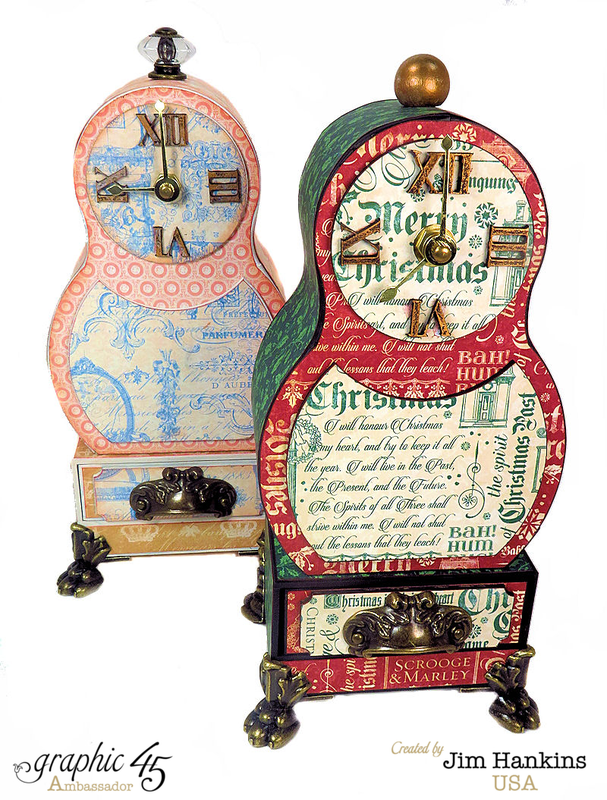 I crafted up a couple of small tabletop clocks for gifts that are inspired by those rounded Swedish case clocks. I did one in Graphic 45's Christmas Carol Paper Collection and one in Graphic 45's Gilded Lily Paper. Hope you take a moment to go over to Graphic 45 and check out the projects. It's coming...Just bogged down at the mo...But soon! Art has been a part of our life for as long as humanity has existed. For thousands of years people have been creating, looking at, criticizing, and enjoying art. I would like to address three questions: what is art, what is its purpose, and why has it survived for this this blog. New Project: Rico's Time Machine Done!